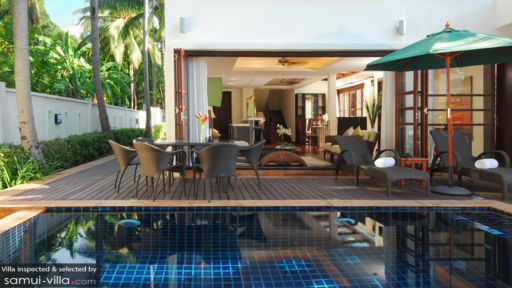 Frangipani Pool Villa is a three-bedroom private holiday home in Koh Samui, Thailand. It offers guests a luxurious and modern stay within short walking distance to the beach. With the sea breeze engulfing the area, guests are sure to have a wonderful time at the villa, as they explore the land and retire to the comfortable living areas and swim in the sparkling blue swimming pool outdoors. A great place to visit with your family and friends, the villa provides security and privacy to its guests along with easy beach access. 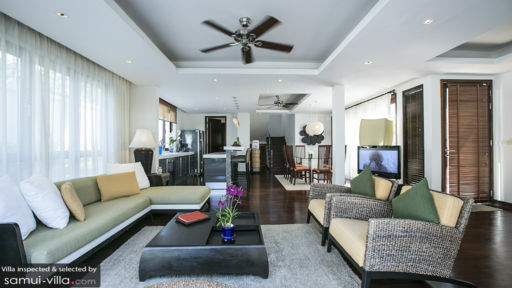 Frangipani features three fully-furnished, air-conditioned bedroom suites, of which one is the spacious master bedroom with its private terrace. Each of the bedrooms is equipped to offer the best in comfort and style with king-sized and twin beds, so you can relax in your own time and space, without any disturbances. The master bedroom is furnished with an ottoman at the foot of the bed, along with a plush armchair beside the window. Sliding wooden doors lead to the en-suite bathroom which has a freestanding bathtub. The other two bedrooms are equally well-furnished and feature en-suite bathrooms with rain shower. 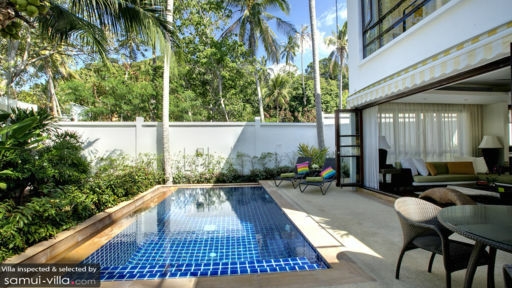 The view from the master bedroom is one that looks out at the tropical vegetation and the neighboring areas of Koh Samui. Not only does Frangipani offer a private swimming pool, which is just outside the main living pavilion, but also allows access to the 25m swimming pool that belongs to The Lotus Terraces Resort. The sandy beaches lie right outside the villa, so all you need to is take a short walk to reach the beaches. The terrace around the pool within the villa is furnished with rattan sun chairs and an alfresco dining area. There are tropical plants and trees that are bordering the pool, so you can breathe in the fresh air as you take a dip. As you ascend the spiral, iron staircase on the side, you will reach the roof which is an ideal location to enjoy the view of the sprawling island ahead, and you can do that while you lounge on the sun chairs placed there. The living area is right beside the swimming pool, and can be accessed through folding glass doors that can be left opened if you wish to relish the fresh, island breeze. The room is naturally lit given the sunlight outdoors, and the glass windows and doors only add to the exotic ambiance. The contemporary style of the living area finds its way into the couches and sofas as well as they are designer, minimalistic and beautiful featuring aquamarine tones with greys and whites. Adjacent to the living room is the dining area and kitchen which comprises a large dining table, that can sat up to 8 people. Sheer white drapes hang on the glass doors, giving off a whimsical feel to the dining area. The kitchen is equipped with a European layout and has all the modern amenities and appliance in place, for your comfort. The villa offers all the modern necessities and comforts to its guests including satellite TV and internet access so you can feel at home. The villa is also child-friendly meaning that you can request for a baby cot, if required. There is daily housekeeping and assistance at the villa for a smooth stay. Private chef service and in-villa massages available on request. If it’s local shopping that you prefer, then Nathon is only 10 minutes by car, where you can even catch a ferry to the mainland. Explore Fisherman’s Village, a popular tourist haunt for its restaurants, shops, and bars. Chaweng is also a must-visit destination, as it is famous for the markets and the local shows.